Today we speak with German mezzo-soprano Daniela Sindram, who appears as Dulcinea in our Sunday/Friday cast for Don Quixote. 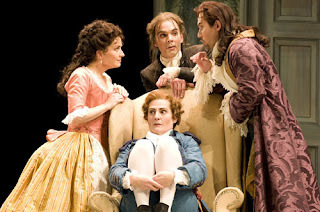 Sindram previously appeared in Seattle as Cherubino in the 2009 production of The Marriage of Figaro, and we ask her what it's like to play "pants roles," as well as what she thinks about French opera and Dulcinea's character. Last time you were in Seattle, you played a boy. This time, your character of Dulcinea is very much a woman! Do you prefer one type of role over the other? I do not prefer one type of role over the other. But, in fact, I sing more pants roles than female parts, though the female parts are becoming more numerous, especially because my voice is developing more and more to the female Wagner parts. So I will sing my first Fricka (in Rheingold and Walküre) this year and next year my first Venus in Tannhäuser. 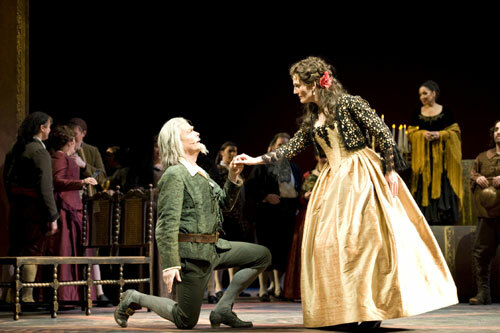 What parts I also really would LOVE to do are Italian parts like Santuzza (Cavalleria rusticana) or Eboli (Don Carlos). But still I love singing and playing boys and I have colossal fun on stage trying over and over again to make the audience forget that there is a woman only pretending to be a young man. Daniela Sindram (seated in the center) as Cherubino in 2009's Marriage of Figaro. Also pictured, standing from left to right, is Christine Brandes as Susanna, Ted Schmitz as Basilio, and Mariusz Kwiecien as Count Almaviva. You’ve performed more Italian and German operas than French ones. What are the challenges specific to singing in French, as you do in Don Quixote? For me, personally, the language itself is a big challenge because I never learned conversational French. That means much more preparation work for me, including how to pronounce and understand each word that you are singing and that others sing, so that you are able to interact. This process is way slower and more intense. Nevertheless, I love the French language and singing in French. I think this language has something sensual and is easier to sing than, for instance, German. I also think the French music invites—even demands—you to connect your emotions directly with the music. 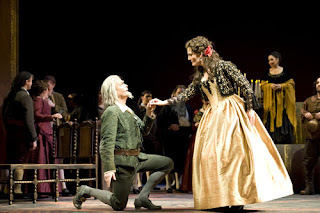 Nicolas Cavallier (Don Quixote) and Daniela Sindram (Dulcinea) in the Sunday/Friday cast of Don Quixote. Is Dulcinea making the right choice by refusing Don Quixote? She says her destiny is to give her love away—what do you think of her outlook on life and romance? Dulcinea finally comes to know Don Quixote as a noble and pure soul, and she realizes that she’s disclaimed a loveable man. But she also understands that she could never be even close to the ideal that Don Quixote formed in his dream world. So this seems to be the only choice she can make. Her outlook on life and romance? I don’t think she believes that love can bring happiness, but maybe now that she knows Don Quixote she has a slight idea of what she’s really been yearning for and maybe it will open her up to real love…. Here in America, there’s a stereotype of German productions as being very avant-garde. As someone who sings in Germany a lot, do you think this is true? That's true. German productions are often avant-garde and unconventional. And sometimes you really can spend a very exciting and fantastic evening in the opera and see pieces from a different perspective. But it also often happens to me that I'm leaving a performance with a big question mark on my face, and I feel overstrained, trying to understand the deeper sense of that new interpretation. But there is a big audience in Germany that demands a new point of view from a director, though there’s also the audience that wants to see a recognizable piece (though maybe with modern staging). So we do have both there: modern and traditional productions. 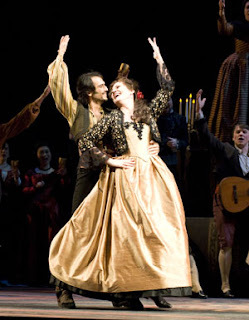 Daniela Sindram (Dulcinea), with principal dancer Raúl Salcedo, in Don Quixote. Don Quixote premiered in 1910. Do you ever get the opportunity to perform music even newer than that? Oh, yes, I regularly do “new”music. Last November I did a production of The Turn of the Screw by Britten (first performed 1954). In the last few years I also sang the part of Sophie in Sophie's Choice by Nicholas Maw which was performed in 2002 for the first time. I also did a piece—Deutsches Stück mit Hamlet from 1998—composed by Wolfgang Rihm, a living German composer. 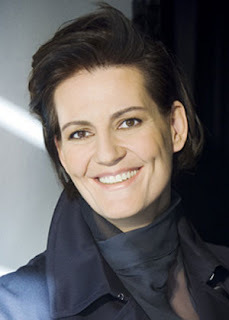 I had the opportunity to meet Nicholas Maw and Wolfgang Rihm in person, but I’ve never had the chance to meet a composer while working on a piece, or to create a new role, which I would love to do. I recently started singing modern songs from different composers and right now I have some unpublished songs from Detlev Glanert (also a living German composer) that I'm looking forward to performing in the future.